This seed bead turtle beadwork necklace is beautifully hand beaded with small size 11/0 Cz seed beads in Red, Orange, Black and irridescent Gold on a white background. This beaded necklace can be adjusted from 26.5" to 30.2 inches (67.3 cm to 76.7 cm) by adjusting the extender chain at the back of the neck. The extender chain and S lock are made of white metal with .925 silver overlay. 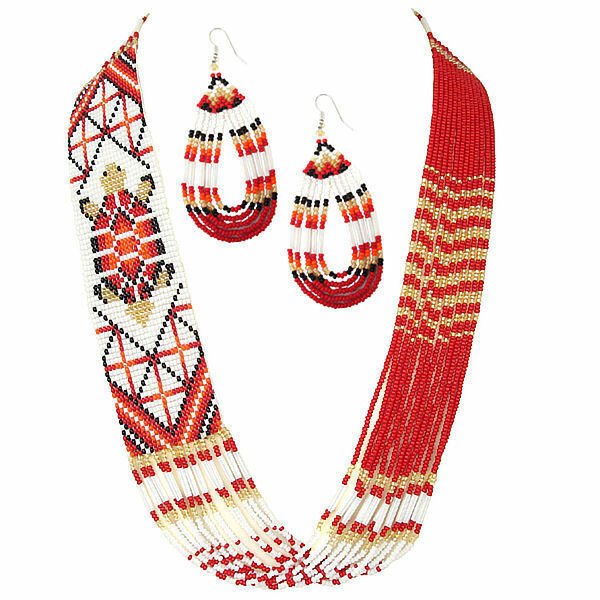 This seed bead jewelry set includes matching earrings. The hand seed beaded earrings are 1" wide by 2 5/8" long (2.5 cm x 6.7 cm), not counting the hypoallergenic french ear wires. A matching beaded turtle bracelet is sold separately. 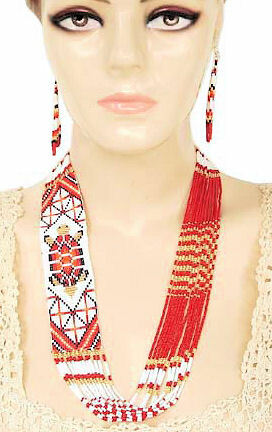 This beaded necklace and earring set is hand crafted.